You’ll know what’s coming first if you’ve already read our article on basement organization. The first step in taking control of the chaos is to get rid of as much of it as you can. Put on your most objective persona and know that to get through this step you have to be as rational and detached as possible. You’re going to have to make some tough choices about items that have either sentimental or financial value, so prepare yourself for the battle ahead. Reset to zero before you start to organize your kitchen. Wash and put away all your dishes and clear things that are not usually on the counters so you have room to work. You’ll need space when you’re emptying each cabinet; we’re resetting remember. Since you’re already a professional at purging after reading both our basement organization and back-to-school decluttering articles, we won’t have to go over the process of purging again. There are some things to keep in mind, however, that are specific to purging items from your kitchen. You’ll probably have a ton of food that’s been forgotten about and needs to be disposed of. Rather than letting it all go to waste, donate as much as you can to your local food bank. Some accept certain items up to a year past their best before date. Do you have a large family? Do you entertain guests often? The answers to these questions will determine the amount of dishes and cups you should hang on to. We have dishes and cups in our home that haven’t been touched since we moved in. You probably do as well. It’s time to say your goodbyes and find them a home where they can be loved and appreciated. How often do you cook? If you buy takeout more than you buy groceries, do you really need 4 different frying pans? Even though many items seemed like a good idea when you created your wedding registry, they’re probably less so today. You remember when you were young and watched people in sci-fi movies using cool handheld computers? They were from a time in the distant future that could look up anything and have the information immediately right in the palm of their hand. Well, that time is now and those people are us. Take pictures of any must have recipe pages or find an alternative on the internet. Know that what they didn’t show you in those movies is all the cookbooks in the blue bin. We understand. We do. You caved and bought that Ronco rotisserie one sleepless night while enjoying a glass of wine. The heavy scent of the new-appliance smell it still has reminds you of your moment of weakness every time you open the cabinet it’s in. If you’re lucky, it’s the only item of its kind in your kitchen. For most, it’s not and all of these items should be donated straight away. Don’t you just love buying things in sets? It’s great having all your things matchy-matchy. Many kitchen utensils come in sets. They seem like a good buy at the time, but now that you can’t close your drawers, probably not so much now. Most of these should be given away. Do you really need 5 different variations of a wooden spoon? As you’re purging, remember to be tough on yourself. If you’ve been keeping something “just in case” you’re going to use it one day, take a lesson from these guys and trash, donate or recycle it if it costs less than $20 and takes less than 20 minutes to replace. And if you haven’t used something in a year then you probably don’t need it—unless it’s a seasonal item. Use black garbage bags for donations and for items you’re throwing in the garbage (if your municipality allows it). For the hoarders among you, this is important advice when tackling kitchen organization. It’ll prevent you from changing your mind and dumpster diving for that banana slicer you bought before your other half showed you how to do the same thing with a knife. We know it’s easier said than done. Parting with items that have significant sentimental or financial value can be hard. So if you still can’t get yourself to part with that vertical bacon cooker or Ronco rotisserie, then put all these items in a box. Label it, store it and come back to it in 6 months to a year. If you haven’t touched the box in all that time, take the unopened box straight to your local Goodwill and donate the entire thing. You’ll love all the space you now have for proper kitchen organization. That’s it for part 1! 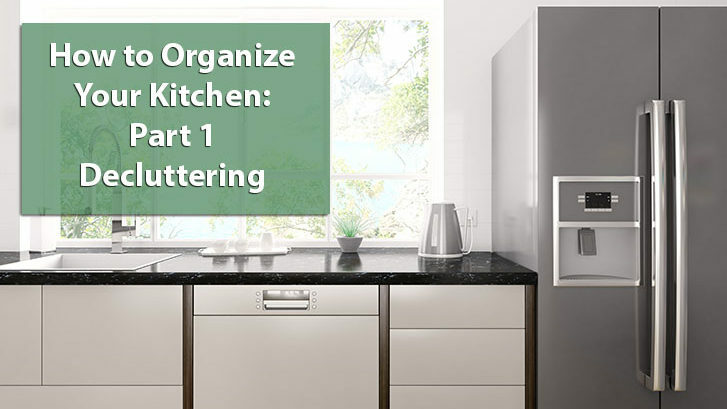 Come back next week when we share some tips in the second part of how to organize your kitchen. In the meantime, follow us on Facebook or Twitter for more tips, news and updates.